No fewer than seven Norwegian defense ministers plus top military brass were facing lots of questions this week, over yet another scandal involving faulty and highly expensive equipment procurement. It’s not just Norway’s frigates that have been troublesome: Helicopters ordered back in 2001 and costing NOK 11 billion won’t be in full service until 2025. Three days of open hearings at the Parliament began Monday into the helicopters that have been plaguing Norway’s governments since 2000. That’s when Defense Minister Bjørn Tore Godal of the Labour Party was supposed to have finished negotiations for and quality-checked the purchase of 14 NH90 “multi-purpose” helicopters. Godal’s staff, according to a highly critical report on the helicopter scandal by the state auditor general’s office (Riksrevisjonen), was supposed to have selected helicopters with known technology. Instead they chose what in practice was a helicopter being developed at an “experimental stage” and when not a single one had yet been produced. The NH90 was developed by four European countries and produced in Italy, designed to carry as many as 16 passengers for up to four hours at a max speed of 300 kilometers per hour. The plan was to place eight NH90s on Norwegian coast guard vessels, to replace their old Lynx helicopters. They would be used for search and rescue operations and fisheries monitoring. The Coast Guard, however, has in practice had to sail without helicopters since 2014. The Navy’s troubled frigates were supposed to get six of the NH90s, making it possible for them to track submarines. Norway’s frigates (now missing one because of the collision and sinking of the Helge Ingstad) are still sailing without operative NH90 helicopters. It remains unclear why the Norwegian military, back in 2000-2001, chose to purchase the helicopters from the jointly owned producer NHI, which had no production experience at the time. After Godal’s colleagues apparently laid the groundwork, his Labour Party government (led at the time by the now-NATO Secretary General Jens Stoltenberg) lost the election to a conservative coalition led by the Christian Democrats. Kristin Krohn Devold of the Conservative Party took over after Godal in October 2001 and the contract with NHI was signed a month later. Devold was in charge until 2005, a period described by the state auditor general as full of problems with the contract that were met with “a long series of problematic, strange solutions.” The first helicopters were due for delivery in 2005, but NHI wasn’t even close to being finished with them. The contract, however, was maintained. Stoltenberg won back government power in 2005 and hung on to it for the next eight years, but problems with the helicopters continued. Anne-Grete Strøm-Erichsen took over as defense minister for the Labour Party and was supposed to take delivery of all 14 helicopters. By the time she was temporarily relieved of her duties in 2009, none were in her possession. It was clear that NHI was not delivering on its contract, yet it was extended once again. Grete Faremo, also of the Labour Party, took over from Strøm-Erichsen until 2011 and the first NH90 finally came to Norway, but the state auditor writes how the ministry and military lacked management and coordination of the phase-in. A new agreement was written for training versions of the helicopter and final versions, but there was a lack of clear decision-making. Espen Barth Eide of the Labour Party succeeded Faremo in November 2011 and then Norway finally sent a delegation to NHI. 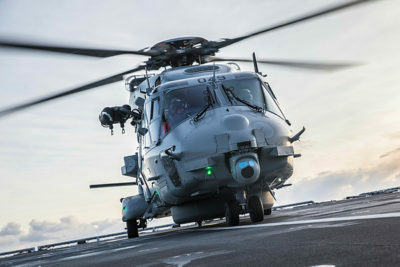 Eide was reportedly close to breaking the contract and replacing the NH90s with American Seahawks, only to find out that it reportedly would cost almost as much to break the contract as to retain it. Aftenposten’s request for insight into the contract was denied. Strøm-Erichsen returned as defense minister in 2012 after being replaced by Jonas Gahr Støre as health minister, but only for a year, since Labour lost the election in 2013. She took delivery of a third helicopter, but still only a training version. Ine Eriksen Søreide of the Conservative Party took over as defense minister in 2013, and received four more helicopters, including the first in a so-called “full” version. Problems continued to mount, however, on the technical front and even on the personnel side, since frustrated pilots quit or reported for duty elsewhere. The last of the Lyux helicopters were retired in 2014, meaning that fully operational helicopters have been lacking ever since. This week’s hearings aim to chart what happened, when and why, who failed to step in and demand improvements and whether the contract could have or should have been broken. Of four Nordic countries that agreed to buy the NH90, only Denmark opted out, ordering American Seahawks instead in 2012. They were available to put into full service in 2017-2018. Aftenposten reported that the scandal exploded after Frank Bakke-Jensen took over for Søreide in October 2017, when she became foreign minister. That’s when it became clear that the helicopters are only capable of flying 90 hours a year, and all that must be reserved for the frigates. Norway’s coast guard, meanwhile, remains without operative helicopters.